Carlos Pena hit a two-run double and Scott Kazmir rebounded from the worst start of his career to pitch six scoreless innings, helping the AL East-leading Tampa Bay Rays wrap up a postseason spot with a 7-2 victory over the Minnesota Twins yesterday in St. Petersburg, Fla.
Cliff Floyd and Fernando Perez facilitated the club's first playoff berth in its 11-year history with solo home runs. The Rays also extended their division lead to 2 1/2 games over the Red Sox. 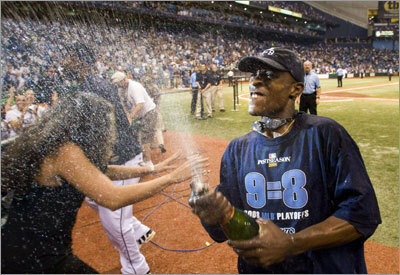 The crowd of 36,048 that packed Tropicana Field stood for the entire ninth inning, chanting "Let's Go Rays!" and clanging cowbells. The Twins delayed the celebration by scoring twice, but the party was on once third baseman Evan Longoria chased down Joe Mauer's foul pop for the final out. Kazmir (12-7), who matched a career high by allowing nine runs in three innings-plus in losing to the Red Sox, 13-5, last Monday, yielded five hits and one walk, while striking out five. "I knew we had something here. I knew we had the depth. I knew we had the pitching," said Kazmir. "I knew we had everything. We just had to put it together, and we did." "It's so special how we've come together," said third-year manager Joe Maddon. "The way we've changed things here so dramatically is remarkable. "We went from being down to being the most unified team out there." Cubs 5, Cardinals 4 - Chicago clinched its second straight NL Central title, hanging on to edge St. Louis before a boisterous 41,597 at Wrigley Field. Ted Lilly (16-9) was sailing along with a 5-0 lead when the Cardinals scored four runs with two out in the sixth, including a three-run homer by Troy Glaus, but Lilly regrouped in the seventh and relievers Carlos Marmol and Kerry Wood held off St. Louis, the latter earning his 32d save in 39 chances. "This team has got to stand on its own merit," said manager Lou Piniella after the game. "We'll give everything we can in the postseason. That's all we can do." Yankees 1, Orioles 0 - Robinson Cano's RBI single with two outs in the ninth allowed host New York to maintain its slim postseason hopes. New York has won four straight and seven of eight and trails the Red Sox by 6 1/2 games in the wild-card race with seven to play. Phillies 3, Marlins 2 - Philadelphia went ahead, fell behind, rallied, and held on to beat host Florida and reclaim first in the NL East from the Mets. The Phillies' eighth win in nine games left them with a half-game lead over the Mets. Braves 4, Mets 2 - Kelly Johnson hit an RBI double off Pedro Martinez (5-6) in Atlanta's three-run first inning, Josh Anderson had three hits, and the host Braves ended the Mets' three-game winning streak. Dodgers 10, Giants 7 - Manny Ramirez drove in five runs with a pair of homers as host Los Angeles maintained its 3 1/2-game lead in the NL West. Reds 4, Brewers 3 - Pitcher Micah Owings' pinch-hit single with the bases loaded in the sixth enabled host Cincinnati to hand CC Sabathia (9-2) his second straight defeat and send Milwaukee to its 15th loss in 19 games this month. Royals 5, White Sox 2 - Kyle Davies (8-7) gave up three hits in seven-plus innings and host Kansas City beat Chicago, which remained 2 1/2 games in front of the Twins in the AL Central. In other games, Francisco Rodriguez earned his 60th save and Garret Anderson homered and drove in three runs to help the visiting Los Angeles Angels beat Texas, 7-3 ... Stephen Drew hit a two-out, two-run homer in the top of the ninth and visiting Arizona ended its 11-game road losing streak with a 5-3 victory over Colorado ... Daric Bartonâs go-ahead RBI single in the eighth helped host Oakland rally to an 8-7 win, handing Seattle its 10th straight loss ... Host Pittsburgh built a five-run lead in the first before holding on to beat Houston, 6-4 ... Chris Young (6-6) allowed just two hits in seven innings and hit the first home run of his career to lead visiting San Diego over Washington, 6-1 ... Shin-Soo Choo continued his hot September (.448) by driving in two runs to help host Cleveland beat Detroit, 6-3.